Part of Indianapolis' no-hitter against Durham on April 29, Wilson suffered a groin injury in mid-May. Though he missed no starts, he didn't pitch effectively, allowing 15 runs on 23 hits and 13 walks in 18 2/3 innings over his next four games. The Pirates' No. 9 prospect was back on form this week, however, holding Rochester to four hits -- without walking a batter -- over seven scoreless frames Monday before kicking off the Indians' one-hit win at Charlotte on Sunday afternoon. Koehler has been a rock for the Zephyrs all season long -- he ranks fifth in the PCL in ERA, third in strikeouts and has gone at least six innings in nine of his last 10 starts. The Bronx-born right-hander allowed two runs on four hits over seven innings against Oklahoma City on Monday before heading to Memphis for his finest outing of the season Saturday night. There Koehler matched a career high with 10 strikeouts and allowed just one hit -- a single with two outs in the seventh -- in 7 2/3 innings. Koehler is 35-14 since the start of the 2010 season. The 28-year-old Clark is in his seventh Minor League season, all in the Orioles system. Though not a big strikeout pitcher -- he has 41 in 80 innings this season -- the right-hander has found success by limiting his walks and home runs. His outing against Portland on Wednesday was a bit of an outlier, but the results were impressive. Clark struck out seven and walked four -- both season highs -- while allowing two singles over seven scoreless frames. A pair of Baysox relievers finished off the two-hit shutout in Bowie's 7-0 win. Corcino, who jumped straight to Double-A this season after fanning 156 batters in 139 1/3 Midwest League innings last season, put it all together against Mobile on Saturday night. MLB.com's No. 98 prospect held the first-half South Division champion BayBears hitless while striking out nine over eight frames. 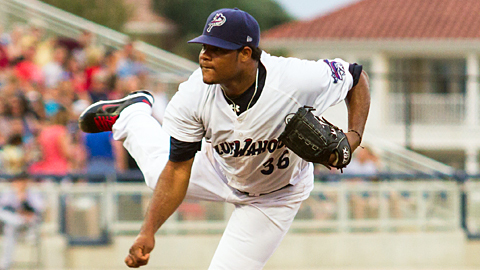 Wilkin De La Rosa struck out the side in the ninth to complete the Blue Wahoos' first no-hitter. Corcino tossed a season-high 110 pitches to notch his first victory since May 3 -- as well as singling in the third for his second career hit. Cabrera has been very good since taking a perfect game into the ninth back on April 17. This week he went back to being spectacular, tossing seven one-hit frames against Northwest Arkansas on Monday (the game ended a two-hit shutout) and allowing an unearned run on three hits over eight innings at Arkansas on Saturday night. The Rockies' No. 18 prospect has gone at least seven innings while allowing three hits or fewer in four of his 14 starts, and ranks second in the league in ERA and fifth in strikeouts. Last Sunday, Inland Empire torched Martinez for seven runs on 10 hits in six innings. Five days later the 24-year-old right-hander turned the tables on the 66ers, holding them to a pair of hits over seven scoreless frames for his first win in a month. After pitching primarily out of the bullpen for Class A Lexington last season, Martinez has already thrown a career-high 72 2/3 innings -- and surrendered a career-high 10 homers -- in the Cal League this year. Three weeks after tossing a seven-inning one-hitter for Class A Hagerstown, Karns picked up his first Carolina League victory on Friday night, fanning 10 batters over 6 2/3 scoreless frames. Despite having pitched just 57 1/3 innings (in which he's allowed 34 hits), the big right-hander leads the Nationals organization with 80 strikeouts. Karns also ranks second in the system with a 2.51 ERA. Left-hander Enny Romero has been a solid contributor to the Stone Crabs rotation this season, posting a 3.30 ERA in 12 starts. On Monday, the Rays' No. 8 prospect showed that he's pretty good out of the bullpen as well. Romero pitched seven innings of no-hit relief against St. Lucie (which owns the best record in the Minor Leagues), striking out six and walking four. It was his second straight outing without allowing an earned run. Romero has held FSL hitters to a .205 average in his 13 outings. Hernandez has allowed just two runs on five hits in his last 14 innings but come away with an 0-1 record. Tuesday's outing at Fort Wayne was the toughest of defeats, as the 23-year-old Michigan native pitched a complete-game one-hitter and took the loss. The news is not all bad for Hernandez, who ranks third in the Midwest League in ERA. Apart from earning Pitcher of the Week honors, Hernandez was promoted to the Class A Advanced Florida State League on Friday. The 23rd overall pick in last year's Draft, Meyer has been all that the Nationals could have hoped for in his first 14 games as a pro. The 22-year-old tossed five scoreless innings in his Minor League debut on April 7 and ranks second in the Nats system in strikeouts and third in ERA. This week he notched his first career shutout, albeit of the rain-shortened six-inning variety. The No. 72 prospect allowed two hits and one walk, struck out five and faced one over the minimum thanks to two double plays.